Great Western is now running its Class 387 Electrostars to Reading and Didcot following handover of the overhead line equipment for passenger services. If you buy an anytime return ticket to Paddington you may save money by splitting your ticket at Slough, as long as you travel on trains which stop at Slough. For example the anytime return fare from Bourne End to Paddington is £25.70 but a ticket from Bourne End to Slough (£6.80) plus a ticket from Slough to Paddington (£16.60) saves you £2.30. With an anytime travelcard you would save £3.40 (Jan 2018 fares). There are no such savings on off-peak or season tickets. However if you have a railcard and need to travel up in the morning peak then an anytime single plus a reduced off-peak single to come back may save you money. Good news! We have observed the temporary ticket cabin being installed at Cookham. The station building has been closed for remedial work after dry rot was discovered. The building is the responsibility of Network Rail. Latest: We now understand that a new booking clerk has been recruited and will be starting work on 02 January but will first have to go through induction and training. It now looks as though TfL, which takes over Taplow and Burnham stations on 10th December, will not go ahead with the reinstatement of the Taplow footbridge. This is despite the fact that we were told it was an insurance job and would be done. Current thinking is that a new footbridge will be installed, with lifts to all three platforms (1, 2/3 and 4). The old bridge is likely to be donated to a heritage railway. It now appears that TfL is not going to install a lift to platform 1, so step-free access will only be available from the north (platform 4) side. This is regrettable because wheelchair users will need to negotiate a dangerous road bridge under the railway with no footpath and which is liable to flooding in order to reach the shopping centre and bus stops. The Department for Transport will exercise its option to extend the GWR Direct Award Franchise by an extra year to March 31st 2020. It is also looking to negotiate a further two-year management contract which will hopefully see out the completion of electrification to Bristol and Newbury as well as the full introduction of Class 387, 800 and 802 trains, and the consequent cascade of older units towards the South-West (Turbos to Bristol, 150s to Devon and Cornwall, 142s to the scrap yard and 180s to Grand Central). In addition a number of High Speed Trains will be reduced to 2-plus-4 formations and upgraded with power doors and accessible controlled emission toilets (i.e. with retention tanks). Regulated rail fares will increase by 3.6% on January 2nd. Overall, fares are expected to rise by 3.4% on average. This is largely caused by the spike in inflation following the Brexit vote, but we think it is monsterous that the Government is making passengers pay an extra 1% on top of inflation (still measured by the discredited Retail Prices Index) while fuel duty for motorists has been frozen for several years. This does not look like a sustainable transport policy. 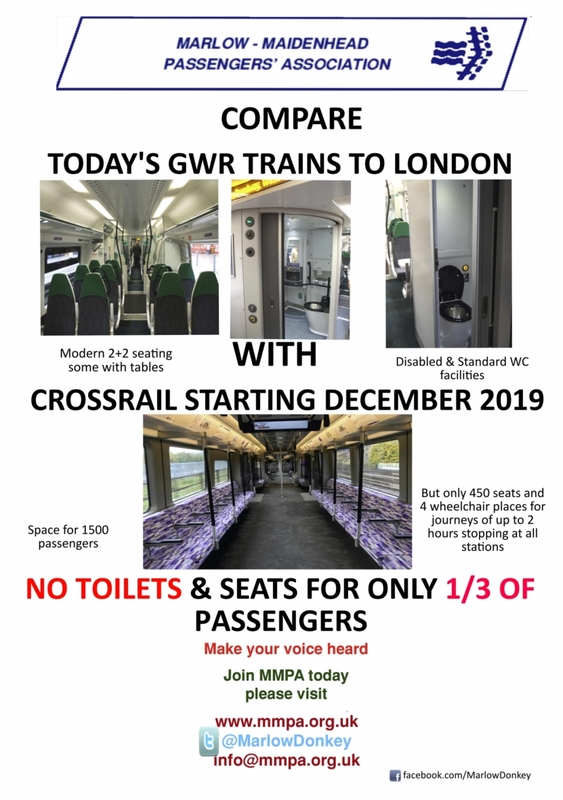 Unlike our current GWR trains or the North-South Thameslink trains, the new East-West Elizabeth Line trains will have no toilets and very limited, mostly inwards-facing seats. A 9-car Crossrail train will have fewer seats than a 5-car Turbo. Click on the image to enlarge. Following an outcry from customers after it announced that its printed timetable booklets would be withdrawn, Chiltern Railways has relented and has produced a limited number of booklets. They are currently available from High Wycombe Station so get yours before they go! Please note the Chiltern timetables change on 10th December. You can download the booklet and a number of derivative leaflets from this page. 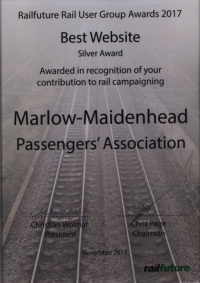 Railfuture has given a Silver Award to MMPA in the Best Web Site category of its Rail User Group Awards. The Stourbridge Line User Group took the Gold. 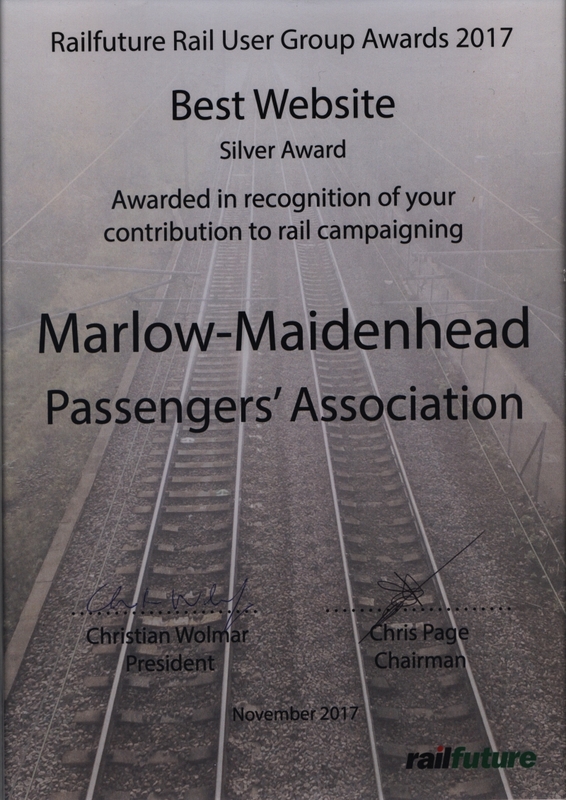 The certificate was presented by Railfuture Honorary President, Christian Wolmar, at the recent conference in Leicester. Own trumpet duly blown! GWR has awarded a contract to Atkins who are undertaking GRIP 1-3* work on the scheme to increase capacity. This will be in two phases: Phase A commencing this week is to design the track layout and to assess whether it will fit within the existing Network Rail land, and Phase B to complete the design up to GRIP 3 (Option selection). Topographical surveys will be undertaken during times when a replacement bus service is running because of Crossrail work at Maidenhead. * GRIP is Network Rail‘s process, Governance of Rail Investment Projects. Update: The survey work has now been booked with Atkins and Network Rail, with possessions booked for 21-23 October and 12 November. Three potential track designs are under consideration, some of which would require derogations (i.e. exemption from certain clearance regulations). The current plan is to complete GRIP 3 by May 2018 but then Network Rail would need a further three months to finalise the design. So realistically we‘re not expecting to see any service improvements before 2019. Update 2: Most of the survey work has been done but one further posession is needed, booked for 24th November with a backup of 6th December. The specification of the project has been agreed between GWR and Network Rail. GWR will be launching an online souvenir shop here featuring the new GWR branding. As a special offer to stakeholders such as ourselves, GWR is offering a 10% discount on all items (excluding postage) on your first purchase. The offer is open until 24th November, so you will need to shop early for Christmas! To claim the discount, you need to enter GWR10 at the checkout page. The car park ticket machine has been removed as it was vandalised beyond economic repair. A replacement is on order but is expected to take about ten weeks to arrive. In the mean time parking charges can still be paid using the APCOA Connect service which accounted for 95% of payments before the incident. We have noticed rather a lot of weekend cancellations of Chiltern Railways services due to staff shortages. We understand that this is because they rely on rest day working and crews increasingly do not want to work on their rest days. As always at weekends, check before you travel. Wycombe MP Steve Baker (Con.) has taken up a number of issues that we raised with Chiltern Railways. You can see the questions and Chiltern’s responses here. Only days after their introduction GWR’s new Intercity Express Trains were withdrawn because of a number of “technical difficulties” regarding the trains’ software (and data, so I’m told). They were back in service on Friday. Trains are not allowed to work the Bourne End to Marlow section without a guard as there is no DOO (Driver Only Operation) equipment at Marlow, such as a platform mirror or CCTV monitors. Network Rail did not complete its electrification works at Reading as planned. Consequently there will be closures around Reading on Sunday mornings from 24th September 22nd October until 12:25 and 29th October to 5th November until 10:25. Replacement bus services and diversions will apply. More information can be found here. Update: Diagram 1 (800 008/9) ran with minor delays. Diagram 2 (800 005/6) had problems on the first journey including an air conditioning fluid leak and a changeover failure. The train was withdrawn at Paddington and substituted with an HST. We understand that it has returned to service. This is third hand information so treat with caution. Network Rail could be thinking about closing the branch for two to three months for a complete infrastructure upgrade including the proposed Bourne End modifications. Replacement bus services would operate. This makes sense although it will be painful when it happens. We have previously been told that there would be no major expenditure on the branch before 2024. We’ve heard of a suggestion to relocate Twyford station to the East to make way for housing. Naturally residents and station users are up in arms about it, fuelled by the local press. We think this is a non-starter because of the disruption it would cause. How, for example, do you get Henley branch trains under the road bridge without having to run on the up relief line? Transport for London has decided not to renew Uber’s licence to operate within the Greater London Area when it expires at the end of September, citing “a number of issues which have potential public safety and security implications,”. Uber is entitled to appeal and can continue to opeate until the appeals process has been exhausted. Travelcard fares have gone up by about 5% this month, apparently because the TfL component increased. This is surprising because London Mayor Sadiq Kahn had promised to hold TfL fares for the whole of his four year term. GWR has revised its timetables starting on Monday 4th September. We have sent printed copies to members who have opted to receive them. These comprise QuickCards 4 and 5 (Paddington to Maidenhead and Maidenhhead to Twyford and Reading) as well as timetables E1 and E8. There are a few changes to peak timings on the Marlow branch, but off-peak and weekend services are unaltered. New portable ticket machines are now in use the branch, replacing the troublesome Avantix Mobile machines. The system uses a Samsung Galaxy mobile phone to handle NFC (co-called “contactless”) payments with separate devices to select the fare and print the ticket. Update: There is a problem with the new printers that could have been forseen. They can hold a stock of 125 blank tickets. A return ticket paid for on a card or mobile phone uses up three blanks, and with NFC payments being much faster than cash or chip-and-pin the tickets run out more quickly. To reload the printer the guard has to return to one of the cabs, and this can take 4 or 5 minutes - longer than it takes to travel between two stations. We are told that the guard could carry a spare pack of ticket blanks which would take only about 30 seconds to load, but this is not always happening. Receipts do not need to be provided for NFC payments unless requested. GWR is offering 50% discounts off standard class single fares for Senior Railcard holders who book before 29th September for travel up to 8th December. More details here. We have been assured by GWR that rumours about the possible demolition of Cookham station are unfounded. GWR is looking to reopen the booking office and will be contacting local press to quash the rumours. Over the August bank holiday weekend lines into Euston will out of use. No Virgin trains will run south of Milton Keynes and no London Midland trains will run south of Hemmel Hempstead. Chiltern will have the only operating route between the West Midlands and the Capital. The industry is asking people not to travel over that weekend unless essential. Consumer magazine Which? is running a campaign to demand a better rail service. You can sign their petition here. With the line between Didcot and Banbury closed all week for permanent way upgrades Chiltern is experiencing heavy demand on its route from Oxford to Marylebone. GWR services are being diverted or replaced by buses. A notice has appeared on the wall, not very obviously, that the access to/from TWYFORD station car park is closing for major drainage work between 22nd and 30th July - on the Hurst Road south side. All vehicles will have to enter and exit down Gun Lane by the Oriental Wok on the north side. Update: The main spans were lifted over the weekend of 1st/2nd July and taken to Stockley by road. The staircases remain in situ. Some photos of the lift can be found here. GWR has informed us that Cookham ticket office is closed until further notice for health and safety reasons. A red dust that had been settling within the office and it is suspected it might be due to dry rot. 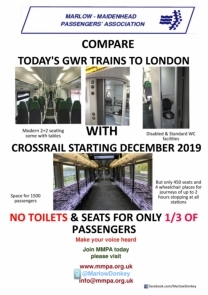 GWR will have people attending site on Monday (12th June) but they do not expect the results of the samples to come through until middle / late next week. They plan to provide a gateline member of staff at Cookham on Monday morning and will look to cover the rest of the week then. Update: The dry rot has turned out to be worse than at first thought, and extensive renovation of the building will be required. Our Station Manager, Alison Hanscomb is trying to get a temporary ticket office installed. We were expecting to have gateline staff at the station in the mornings to sell tickets and assist passengers but this seems to have lasted two days. As a result of the closure our long-serving booking clark, Barry Haines, has decided to bring forward his retirement. He had intended to retire later this year. We know that Barry will be missed by all of his customers and we wish him the very best for his retirement. Update: We are not aware of any progress with the temporary ticket office and are pursuing this with GWR. Chiltern Railways have announced that the May 2017 printed timetable will be their last. After that information will only be available online or from notices at stations. MMPA has argued that this unfairly penalises passengers who do not have internet access, and would like to see the timetables continued. We also understand that Chiltern is withdrawing catering facilities from all sevices. Passengers using the business class coaches will get a cold drink and biscuit left on the table. These retrograde measures are being introduced by Arriva to cut costs, and sadly the spirit of Chiltern is steadily being eroded. From mid-May APCOA is taking over the management of all Chiltern Railways car parks which will be equipped with automatic number plate recognition. If no payment is made within a certain time a penalty notice will be sent to the registered keeper. Following the demise of the last through services from Bourne End to London, GWR will be running an additional morning service to/from Marlow in the May timetable. The branch service will provisionally operate roughly as at present up to the 0815 departure from Marlow and 0826 from Bourne End. The next departure will be 0844 from Marlow, 0856 from Bourne End. The Marlow shuttle will return to Maidenhead at 0905 after which the hourly service will operate. From Maidenhead there will be a service at 0841 to Bourne End with a connection to Marlow instead of the 0902 service to Bourne End only. Thereafter departures will be hourly at around xx38. The evening and weekend services will be more or less as now. In connection with the final day of public service, Chiltern Railways has announced that the following additional trains are planned to operate between Princes Risborough and Aylesbury, using the green Class 121 single car DMU, 121034 (we understand that 121020 is not operational at the moment). These trains are subject to availability and to short-notice cancellation or alteration in the event of disruption or late running of other services on the day. Normal tickets will be valid on these services; these trains will not call at either Monks Risborough or Little Kimble. Introduced in 1960, these units are the oldest vehicles in regular passenger carrying service (quite a few locomotives date from the same era) on the British mainland, excluding heritage lines. Only the ex-London Underground 1938 tube stock on the Isle of Wight is older. See above for links to the new timetables. Apart from the change described opposite, there are adjustments of up to five minutes on most peak services. The daytime off-peak service, the first two and last two services, and the weekend services are unchanged (but check for bus replacements). Initially the following electric services will operate: From Paddington 1609, 1642, 1714, 1742, 1842, 1912 and 1936; from Maidenhead 0733, 0742, 0842, 0907 and 1818. The 0742 and 0842 from Maidenhead will call at Taplow until 29th September. We understand that new protable ticket machines will be introduced on the branch by the end of May, replacing the troublesome Avantix Mobile machines. Guards are currently undergoing training. The long-promised new Fujitsu machines will be able to accept NFC (“contactless”) smartcard and mobile phone (Apple Pay etc) transactions. The launch was delayed by negotiations with the banks over the problem of validating transactions in places where the mobile data signal is lost but these machines have been rolled out in other areas. The overhead line between Stockley and Maidenhead was successfully energised at the third attempt on Sunday 26th March. This will allow testing and driver training with the new Class 387 trains to go ahead. All being well Great Western plans to commence electric services between Paddington and Maidenhead at the May timetable change. The remaining stretch from Maidenhead to Tilehurst should be completed in time for electric services to run through to Didcot Parkway in January. GWR hass not yet finalised service details from January 2018 as plans have had to be changed following the Hendy cutbacks. GWR has confirmed that from 3rd July it will operate four trains per hour off-peak serving Reading, Twyford and Maidenhead when off-peak electric services to Maidenhead begin. Update: We understand that the turnback siding and stabling sidings at Maidenhead have now been commissioned, which should allow electric trains from Paddington to commence on 22nd May (peak hours only). We were expecting the bridge to be lifted over the bank holiday weekend, but then it was discovered that a number of cables ran over the bridge and these will need to be rerouted before the bridge can be lifted. The latest plan is to remove the footbridge in parts over two weekend nighttime possessions on 1/2 and 8/9 July. Work is now starting to prepare the footbridge for removal for offsite repair. The next opportunity for the bridge to be removed would be the bank holiday weekend at the end of May. We are awaiting confirmation from Network Rail (via Crossrail) whether or not it will be ready to be taken away then. Watch this space. Update: The plan now is to remove the span over the Relief lines overnight on 1st/2nd July. If there's time the span over the Main lines will also be removed, otherwise this will be done over the following weekend. A 500 tonne crane will operate from the south car park. The bridge components will be taken by road to Network Rail's Stockley site for assessment. It is hoped that the footbridge will be reinstated by the end of December 2017 after which TfL will begin work on an accessible (i.e. with lifts) bridge at the London end of platforms 3 and 4. Update: Chiltern has informed us that Network Rail has quoted a price of £250,000 for installing a banner repeater which would show drivers the signal aspect when the starting signal is obscured by the new footbridge. This looks to us like a “we don’t want to do it” price. Chiltern does not have the resources to fund this at present. Courtney Buses is abandoning loss-making routes 8 and 16/A at the end of April, citing the Council’s reduction in subsidy to cover free bus passes. The Royal Borough’s bus champion, Cllr Hari Sharma (Con., Furze Platt) has said that the Borough is in the process of putting the routes out to tender and might have to pay more. We have learnt that electric services to Maidenhead might not begin in May after all because the overhead line equipment may not be ready in time. GWR is still, publicly at least, aiming for the May timetable change. For Network Rail the planned date in the Hendy Report of the end of June. Update: the overhead line equipment was energised on Sunday 26th March. This paves the way for testing and driver training with the new trains. Wycombe District Council has backed a £100,000 high level feasibility study over two years into the possibility of reinstating the Bourne End tp High Wycombe line which was closed by BR in 1970 after employing devious ploys to reduce travel. The funding comes from the Community Infrastructure Levy. Major Disruption This Sunday A.M.
Additional engineering work will take place between Reading and Paddington this Sunday, 26 March. This will allow Network Rail to complete a key piece of work for the electrification of the Great Western mainline. This means significant changes to London Paddington rail services throughout Sunday morning. Services will operate normally after 13:00 and GWR is encouraging customers to switch to later journeys. To help with that GWR will accept fixed train tickets on services running later in the day. Full details of the changes are on the GWR website here. GWR informs us that there will be a phased introduction of Class 387 Electrostar trains on services to Maidenhead. May 21: electrics replace diesels on peak services starting from or terminating at Maidenhead, but running to diesel timings. Through trains from Bourne End to London cease. July: enhanced electric service to Maidenhead replacing Reading locals. This means 2tph at Twyford which should connect with 2tph service to Henley-on-Thames (1tph calling at Wargrave unless a connection is missed). December 2017: electrics operating through to Twyford and Reading. This is a subject that’s been causing a bit of a stink for some time and we've been trying to get to the bottom of it. Well now we have thanks to our contacts at GWR, and guess what, it's all down to piles. I mean the sort Network Rail (NR) has been banging into the ground to support the overhead line equipment (OLE). “The platform 4/5 toilet drainage has recently suffered a blockage that closed the toilets for use by our customers. The blockage was eventually found to be OLE piling damage and NR is now planning to divert the drainage pipework. The drainage pipework was pumped out, blockage removed and the toilets re-opened for use. The toilets are currently open for use. “NR’s OLE team is monitoring the situation and will pump out the drainage system whenever required, until the drainage pipe is successfully diverted.” So now you know. Update: The date has now been put back to 5th March. GWR is still confident that it can start electric services to Maidenhead on 21st May. The Rail Accident Investigation Branch (RAIB) has issued its report on an incident which occurred at Twyford on 7th April 2016 in which an occupied wheelchair came into contact with a passing freight train. A teenage girl in her wheelchair was parked parallel to the track and well back from the yellow line on platform 4. The brakes were not fully applied and the girl’s mother was looking the other way. The train passed at 45mph but its slipstream was sufficient to move the wheelchair. Because the brakes were uneven the chair turned towards the train where it came into contact with waggons three times. The third impact knocked the wheelchair away from the train. The girl sustained a minor injury to a toe and slight damage to her chair. Wheelchair users and other vulnerable station users should be aware that trains passing platforms, particularly freight trains, can generate slipstreams which are strong enough to move wheelchairs and pushchairs even if the brakes are on, especially if the effectiveness of the brakes has deteriorated with age or wear. It is always better to park well away from the platform edge and to hold onto the wheelchair or pushchair when a train passes by, even if the brakes or wheel locks have been applied. The report notes the lack of an appropriate warning notice on platform 4 and criticised the use of automatic announcements of passing trains on platforms not accessible to the public. These reduce the effectiveness of announcements on platforms that are in use. It appears that, unsurprisingly, GWR has a huge backlog of compensation claims mostly due to infrastructure faults, exacerbated by a change of system. If you've submitted a claim it will be dealt with but it may take a while. We've been alerted to three extra stops at Taplow by fast trains to and from Paddington on weekdays. These are 0746 to Slough and Paddington, 0846 (from Bourne End) to Slough, Southall and Paddington, and 1810 Paddington to Henley-on-Thames (1842 at Taplow). We understand that this is a temporary arrangement to relieve pressure on Maidenhead because of the closure of Silco Drive car park until the end of September.